Aerial view of Pearl Harbor, Ford Island in center. The Arizona Memorial is the small white speck on the far right side close to Ford Island. 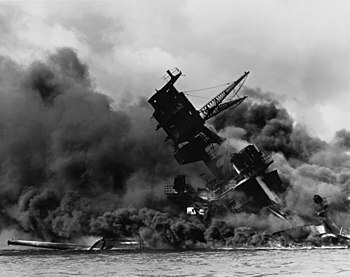 The Japanese bombed Pearl Harbor, on December 7, 1941, which was a surprise. The attack led to America's fighting in World War II. The reason the Japanese attacked Pearl Harbor was to destroy the U.S. Navy (Seventh Fleet), and prevent the U.S from stopping the Japanese expansion in Asia. This page was last changed on 26 August 2018, at 10:19.